2 mg of cellular extract from Hek 293 cells were pre-cleared with 50 μl of protein G sepharose for 30 minutes at 4 °C before the supernatant was incubated with 5 μg of anti- MSK1 (384 – 402) and 50 μl of protein G sepharose for 1 hour at 4 °C. The supernatant was removed and the pellets washed with lysis buffer before being subjected to SDS/PAGE and transferred to nitrocellulose membrane. 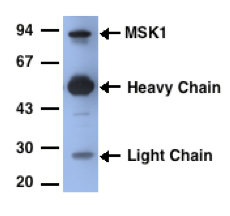 The membrane was then immunoblotted with anti- MSK1 (384 – 402) at a concentration of 1 μg/ml. Binding of the primary antibody was detected using rabbit peroxidase conjugated anti- sheep IgG antibody (1 in 10, 000 dilution, Pierce) followed by enhanced chemiluminescence (ECL, Amersham). “MSK1 and MSK2 are required for the mitogen and stress induced phosphorylation of CREB and ATF1 in fibroblasts.